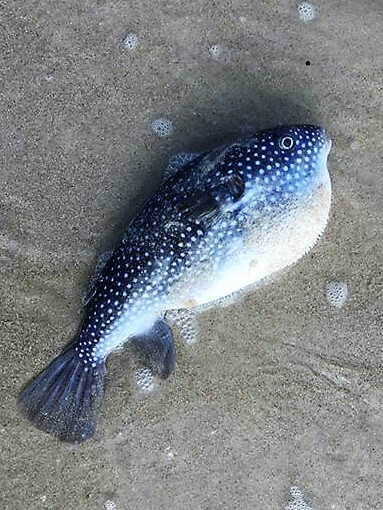 Mainstay Puffer, Arothron firmamentum, sighting at Brighton, SA | Marine Life Society of South Australia Inc. I was pleased to soon see that Mark McGrouther had agreed with my identification of the Mainstay Puffer, Arothron firmamentum on iNaturalist. Mark is the Fish Collection Manager at the Australian Museum and curator for the iNaturalist ‘Australasian fishes’ project. “Sea Fishes of Southern Australia” by Barry Hutchins & Roger Swainston features a Starry Toadfish as Arothron firmamentum (but Arothron firmamentum should be a Mainstay Puffer). “Guide to Sea Fishes of Australia” by Rudie Kuiter features a Starry Toadfish as Arothron stellatus and doesn’t feature Arothron firmamentum at all. “Coastal Fishes of South-eastern Australia” by Rudie Kuiter features both a Starry Toadfish, Arothron stellatus and a Mainstay Puffer, Arothron firmamentum on the same page (422). It says that the Starry Toadfish, Arothron stellatus, is very widespread in the tropical Indo-Pacific whereas the Mainstay Puffer, Arothron firmamentum is said to be widespread in south-eastern waters of Australia. I have now posted Lee’s sighting with Redmap.